Here’s a set of New Year’s Resolutions for your Brain. The aim is to develop critical thinking skills and the love of lifelong learning. These things do not come naturally – they need practise. But what they will do is make your life a whole lot more enjoyable and clarify your whole reason for existence. Nobody can clarify this for you, but you. Learn the difference between critical and non-critical information. Many irrational concepts will always appear in the mix – that’s the human influence. It is important to be able to identify and filter out baseless contradiction and to give appropriate weight to emotional argument. Based on all of the evidence found, employ logic and reason as the process of drawing to a conclusion. It’s better to be rational than irrational. If you know something is wrong and you know why it it is wrong, stick your head up and say or do something about it. But criticism is only of value if you can show why that criticism is justified. Criticism is not contradiction. Criticism is making a judgment as to the merit, effectiveness, utility or correctness of the object in question. It involves discussing both sides of the argument. It involves helping the one being criticized to realize their mistake. If we don’t criticize, we allow false definitions and concepts to propagate. If you’ve worked through resolutions 1 through 4, you’ve earned the right to 5. The human brain contains more than 100 billion neurons, which are electrically active brain cells that process information. Each neuron is linked to as many as 10,000 others. These links, or synapses, are crucial to the biological computations that underlie perception and thought. Just as muscles can be developed then can lose tone and strength without ongoing excercise, neural links are formed throughout schooling and can be lost without ongoing brain exercises. Give yourself the time to say once a month work on some puzzles. By practising solving puzzles, you are obviously improving your thought-processes of retrieving, storing and arranging information in an optimal fashion; finding or originating a set of optional hypotheses which can make sense of data; reducing the options by elimination until the correct or best answer or answers have been isolated; and the communication of that answer. A mind enhanced by a little interesting and enjoyable training helps open your eyes to the solution of everyday problems – of life and the desire for success. Buy a puzzle book or try my Enigma Challenge. If you decide to make these resolutions and work toward achieving them in 2009, I guarantee you will have a better life. It’s all in your mind. Have a Thoughtful New Year! Excellent resolutions! I love that you have encouraged us all to wake up and think for ourselves. Thinking for a living! What a wonderful concept and an even richer reality when it is executed upon. Love your writing and the way you are thinking! This all sounds like hard work! The results of this hard work would probably take some time to appear as well. Surely there is a tablet I can take that will give me all these things instantly? Now there are some worthwhile resolutions! Interesting blog you have here! No resolutions as yet. But may take your advice to try and think better! Great piece of writing. Clear and rational thought is the only way forward. You might enjoy reading David Lovejoy (our local newspaper editor) on the probable necessity for men and women of sense and goodwill to fight for a new enlightenment. Thanks Mark. The people of the Byron Shire are fortunate to have such a local newspaper editor. It’s a good piece. 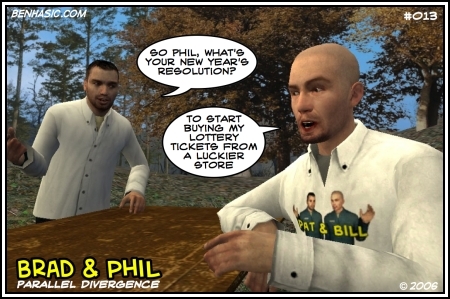 Do you like the new Brad & Phil page in the top menu?